There are three Adventist schools in the Marshall Islands: an elementary school and a K-12 school on Majuro, and a K-12 school on the second-largest island, Ebeye. The first Seventh-day Adventist school in the Marshall Islands was founded in 1968 in the community of Laura on Majuro. Girls and boys from about age 5 perform household duties, and elders too old to cook or fish weave mats and handicraft or repair tools, dwellings, and watercraft. To Sabbath School teachers: This story is for Sabbath, April 21. Click here for photos to share while telling the mission story. Ask a girl to read this first-hand account. I used to slap and punch other girls. One time during recess, my classmates and I were chatting around the table in our classroom at Ebeye [pronounced: EE-by] Seventh-day Adventist School in the Marshall Islands. I was hungry, but I didn’t want to run across the street to MJ Store to buy a snack. The girl didn’t want to go. “You’re so boring!” I exclaimed. Then I laughed and punched the girl—hard—in the shoulder. The girl was smiling and laughing until I struck her, but then she grew quiet. I guess she didn’t like being hit. But I couldn’t stop myself. Every time a classmate didn’t do what I asked, I would punch or slap her. I always laughed and thought that I was acting playfully, but for some reason the other girls didn’t think it was funny. Then we had a week of prayer at the school. The pastor read from the Bible about how we should repent from our sins to draw closer to Jesus. He spoke about how Jesus will return soon and take us to live with Him forever. I wanted to live with Jesus, and I decided to be baptized. When I told the pastor, he was happy and said I needed to ask my parents for permission. Then I became scared because nobody in my family belonged to the Adventist Church. I was so scared that my parents would be angry that I didn’t ask them and I didn’t get baptized. A year passed. I kept jokingly hitting the girls in my class, and they became quite unhappy. My teacher also wasn’t pleased and told me to stop. Then we had another week of prayer. The more I learned about Jesus, the happier I became. I wanted to be closer to Jesus and to be happy all the time. I realized that I loved Jesus more than I was scared of my parents’ reaction to my wanting to be baptised. When I told my parents, they didn’t say anything negative at all! They said was old enough to make my own decision. A few days after my baptism in 2016, I was lying on my bed and thinking about my life. I remembered all the times that I had hit other girls, and I felt horrible. I resolved to change my attitude and be nicer. I decided that if the other girls asked me to buy something at the store, I would try my hardest to help them. With Jesus’ help, I haven’t punched or slapped anyone again. When I just think about hitting someone, I feel awful. Jesus has changed my heart, and I am grateful to Him! 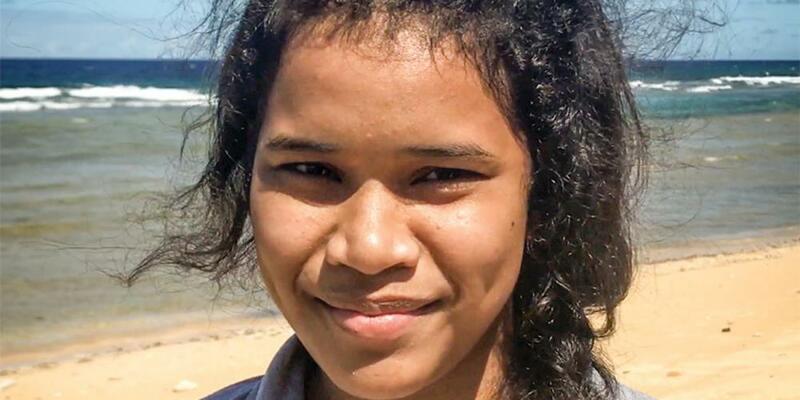 Flora is now 17 years old and studying in the twelfth grade at Ebeye Seventh-day Adventist School. She also is the secretary of the youth group, called Children of Promise, at the Ebeye Seventh-day Adventist Church, which meets in the school. Her brother Lucky was baptized in 2017. We will read about him next week. Part of this quarter’s Thirteenth Sabbath Offering will help the Ebeye school carry out urgent repairs on its old classrooms so it can continue teaching children about our God who changes hearts. Thank you for your mission offering.